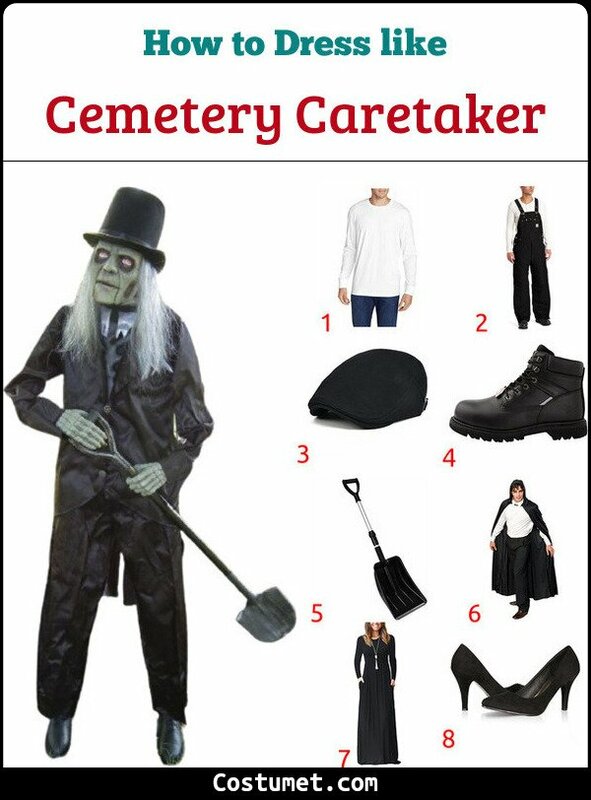 Cemetery caretakers or gravediggers don't have a specified or strict dress code. However, we often have the idea that they always wear black or dark color since it suits with the funeral scene. In this article, we will give you both male and female versions of the cemetery caretaker. For male version, he should wears a white long-sleeved shirt, a black overall jumpsuit, a black ivy cap, and black boots. They also carry a shovel as a tool. For female, she should wears a simple black dress with high heels. If you like to recreate this look, checkout our list down below! 1 White Long-Sleeved T-Shirt Get a plain white T-shirt with long sleeves to wear. 2 Black Overall Jumpsuit Pair up your white top with a black overall jumpsuit. 3 Black Ivy Cap Get a black ivy cap to wear. 4 Black Working Boots Match up your outfit with a pair of working boots in black color. 5 Shovel Prop Get a shovel to carry as a prop. 6 Black Cape This is optional. Look for a black cape to top over your outfit. 7 Black Long Dress For ladies, find a plain black long dress with simple style to wear. 8 Black Shoes Look for a pair of black shoes, such as high heels, to match the dress. 9 Crest pin Carry a crest pin as a prop. Cemetery Caretaker is a basically a cemetery work who digs a grave in prior to the burial service in funeral. Cemetery caretaker or gravedigger is often found living in churches' area since the graveyard is a part of them. Many times, this type of work is passed down family, from the older to younger generations. But it is also not uncommon to see people volunteer for the job. Speaking of the myth that comes with the occupation like this, many people often link a gravedigger to supernatural stuff: believing that they may see ghosts all the time for example. The zipper face makeup gives the illusion that you have an open zipper running across your face, showing your bloody flesh below.